Hey everyone! I CAN TYPE!!! :) Surgery went great and I am excited to be sort of back to blogging. I am taking it slow though, as the hand can get sore easily. 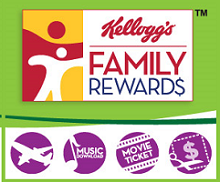 So, I just entered this NEW Free Kelloggs Family Rewards code myself so I know it is valid as of today. Get it in soon though so you don't miss it!